Choosing the most romantic luxury safari experiences is extremely difficult, because everything about safaris are romantic! From the seclusion and the surrounding wilderness to the beautiful lodges and camps we have here in Africa, this is a travel experience that is perfect for romantics. Here are some of the most special things you can experience with your partner. Bubbles and the bush. Credit: Londolozi Granite Suites, South Africa. Admire the star-strewn sky all night long from your very own, private, open-air bed set in the middle of the wilderness. Star beds are usually set up on a platform with a guide nearby (but not too close!) in case you need anything during the night. 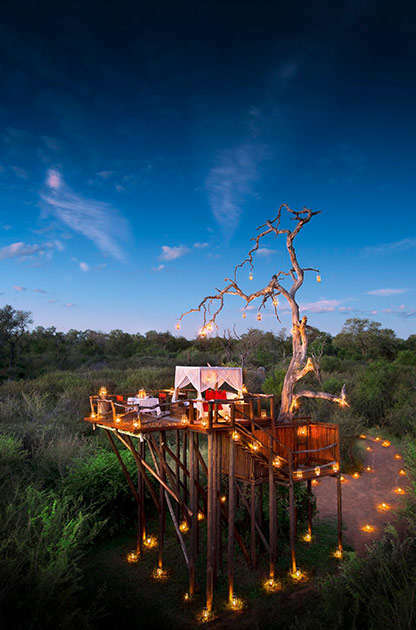 Lion Sands in South Africa has a really beautiful sleep-out in a lantern-lit treehouse. Enjoy a private dinner on the deck first, before turning in for the night. The treehouse at Lion Sands, South Africa. Of course, part of the romance of being on a luxury safari is simply hanging around your suite, enjoying each other’s company. Suites with private plunge pools are perfect for being able to cool off in the heat of the day without having to be around a communal pool (for really loved-up couples, this is best for everyone concerned). Royal Malewane’s suites each have their own pool overlooking the South African bush. For all-out luxury, this is one of the best. The private plunge pools at Royal Malewane. 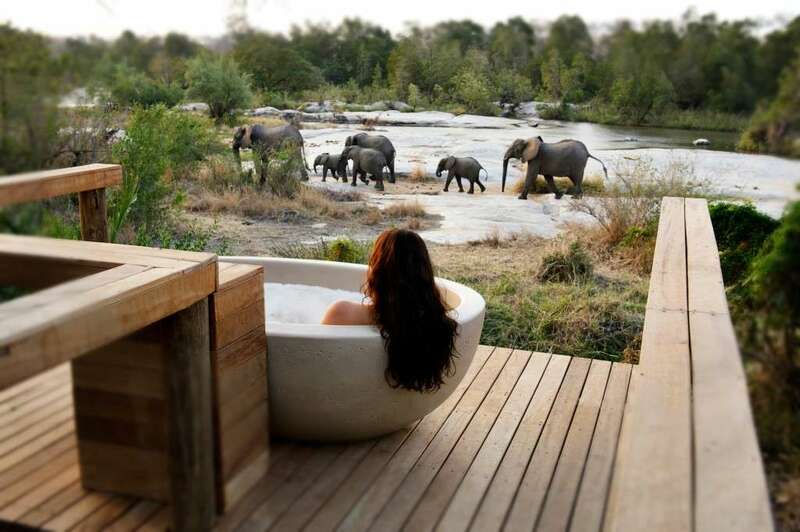 There aren’t many places in the world where you can take a bubble bath in the middle of nowhere, but there are several safari lodges that allow you to do just that. 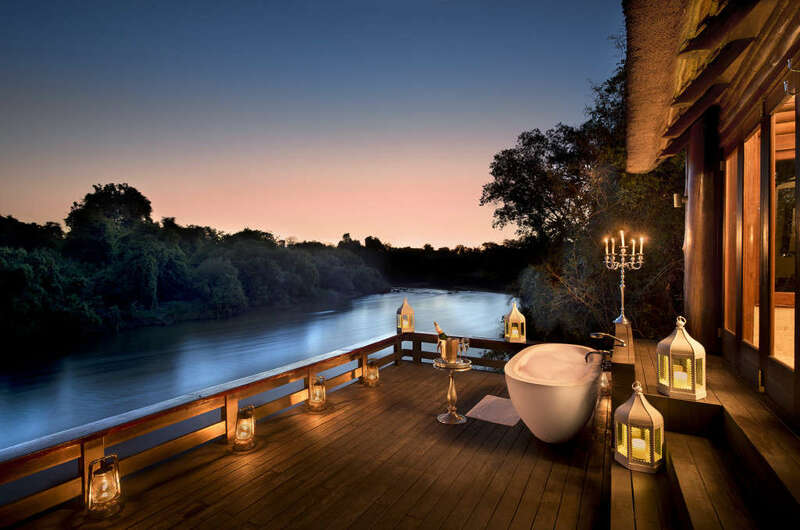 On the banks of the Zambezi River at Royal Chundu, a short drive away from Victoria Falls, you can unwind after a day of activities or travelling in a frothy bath on your private deck. Because we only do things at a ten, rest assured that the champagne will be chilling for the two of you to sip as the stars sparkle above. Starlit bathing at Royal Chundu. There is something so nostalgic about a proper picnic, with blankets and hampers and views to die for. Share a picnic lunch in the great outdoors, enjoying homemade food prepared back at the lodge with chilled wine or G&Ts. For the ultimate in romance, you can have a picnic at the place featured on the Out of Africa film poster when you stay at Angama Mara, Kenya, which is located on the site of the famous film. Your Masai guide will take you to this scenic lookout point where you’ll find your picnic with checked blankets, cushions, canvas chairs, bubbles on ice for sundowners or coffee if you’re enjoying the view over breakfast. Angama Mara offer the ultimate ‘Out of Africa’ picnic. Frankly, pretty much anywhere you watch the sunset can be romantic, but when a blazing sunset is seen from a little dhow boat or river cruiser, everything just gets taken up a notch. Watch the sun sink below the horizon, drink in hand, loved one by your side, as the water and sky change colour around you. 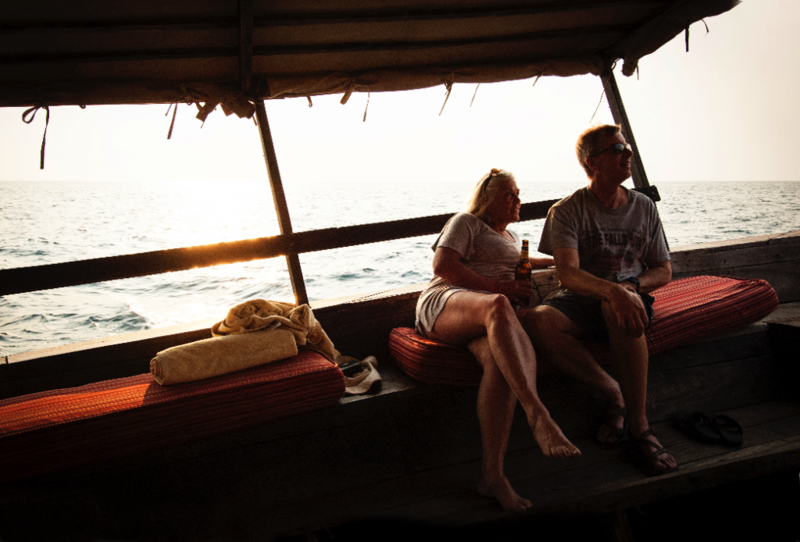 One of our favourite places for sundowners on the water is at Greystoke Mahale in Tanzania, where you can head out on a dhow boat across Lake Tanganyika as the day draws to a close. Sundowners on the lake at Greystoke Mahale. It doesn’t get any more romantic than this. For the absolute pinnacle in safari romance, cement your love for one another by getting married or renewing your vows in the wilds of Africa. Many lodges can organise beautiful weddings – Chem Chem is one such camp. 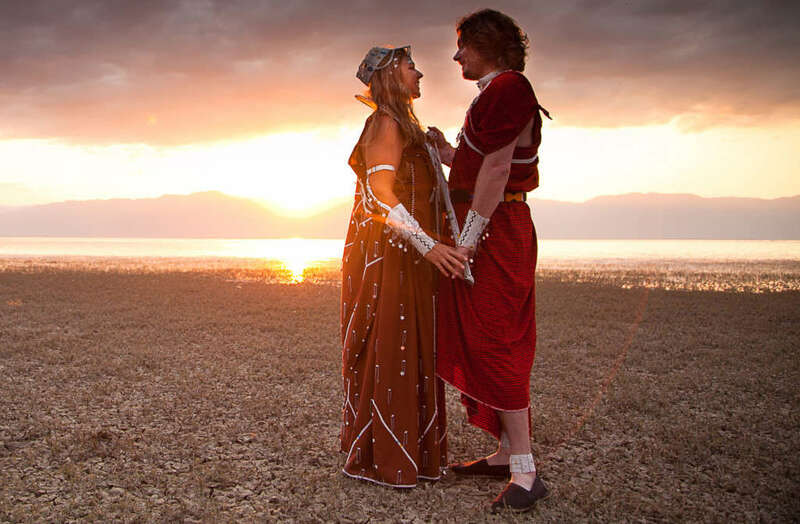 On the banks of Lake Manyara, you can renew your vows or say ‘I do’ for the first time in a very special Masai ceremony.